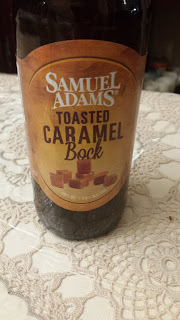 This week's Sunday Night Suds looks at Samuel Adams Toasted Caramel Bock. The Toasted Caramel Bock is included in the Samuel Adams Fall Sampler Box, containing the flagship Boston Lager along with Bonfire Blonde, Hoppy Red, Maple Ale and Octoberfest. I did not purchase the entire box, but a friend who knows my proclivity for trying new beers brought this over to try last Friday Night. We tried this together with Mrs KB and had some mixed reviews. This beer has some extra sweetness which comes from the molasses added to the brew process. There are some bock notes behind the added sugar and the beer is not entirely one note, but it is primarily an overly sweet, dessert type beer. I would not recommend this brew with any kind of main course, but it would be nice in small quantities with baklava or maybe pecan pie. The Samuel Adams Toasted Caramel Bock is under the Kosher Supervision of the Star-K and has a Star-K certification mark on the label. To see what the experts on Beer Advocate think about this brew, please follow this link - beeradvocate.com/beer/profile/35/225611.